Xiao-Zhun's world is like the elevator she operates in a department store: static, polite, low-key. 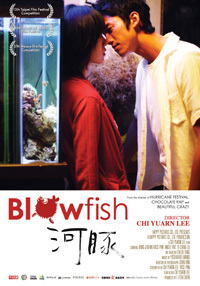 When she catches her boyfriend cheating on her, the shy girl decides to find a better home for her pet blowfish. A lonely baseball coach purchases the blowfish at an internet auction. He is waiting in his trashed home for his wife, who left him. When Xiao-Zhun takes the Blowfish across town to his house, they make passionate love in the surreal blue light of his aquarium. She stays with him, but their love staggers like a blowfish… until one day, the Coach finally wants to learn this girl’s real name. "A trembling sorrow"... I don't know why, but this thought ran through my head throughout the filming of Blowfish. Is it because the blowfish swims with both humour and grace? Or because it stares through eyes both fresh and awkward? It gradually became a kind of symbol, a delicious poison, a contradiction. It's tricky. Love is tricky. Lee Chi-Yuarn is a widely acclaimed writer and poet in his native country Taiwan and works as an assistant professor at the National Taipei University of Arts Film Department. After a few short films he wrote the award-winning script for his first feature film HURRICANE FESTIVAL, which won several prizes at international film festivals. Also his following feature films, CHOCOLATE RAP and BEAUTIFUL CRAZY, have been successful world wide and received numerous awards. His film BLOWFISH is continuing its successes! Vicci Pan trained in acting at Taipei National University of the Arts under Director Lee’s supervision. She participated in several short film productions. In her feature debut BLOWFISH she has been nominated for the Most Promising Newcomer and Best Actress awards at Taipei Film Festival. Her charisma and expressive subtlety have already begun earning her numerous accolades. Wu Kang Jen is an up-and-coming star in Taiwan. Under Director Lee’s supervision, he trained in acting and improvisation at Taipei National University of the Arts. Before moving into films, he was one of Taiwan’s top models. He was nominated for the Most Promising Newcomer and Best Supporting Actor awards for MIAO MIAO at the 2009 Taipei Film Festival. In 2010, he starred in the popular TV drama AUTUMN'S CONCERTO. Production Company: Happy Pictures Co., Ltd.